I can always count on Mark Bittman. 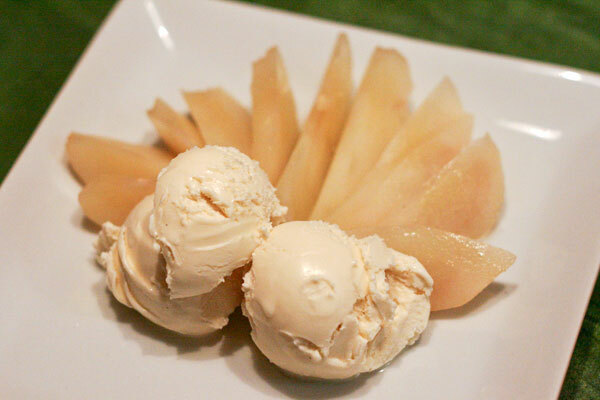 In How to Cook Everything, Bittman recommends poaching pears with sugar and vanilla bean for a simple, light dessert. And that’s exactly what we needed after pizza and ravioli. We were really not very hungry, but I had to finish out the Challenge with my third and final course. So I peeled and cored one big Bosc pear. (Bosc pears are dense and fragrant and excellent for poaching.) 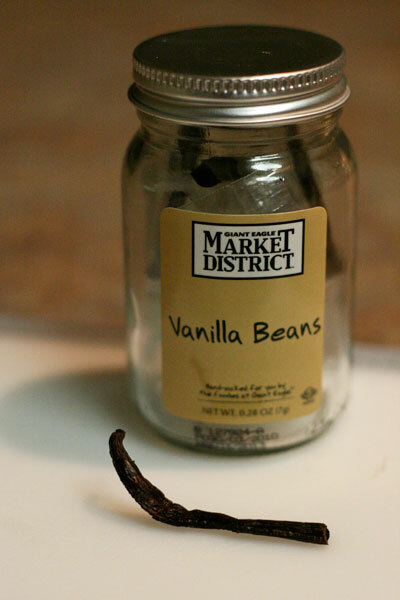 Then I boiled 2 cups of water with 1 cup of sugar and added the aromatic beans from 1/4 of a vanilla bean. I submerged the pear in the liquid and let it do its thing. Twenty minutes later we had the base for our delicate dessert. I let it cool, then sliced it and arranged it on a plate with two scoops of vanilla frozen custard. You could use the same method to poach apples, apricots, peaches, and pineapples. Bittman also recommends using star anise, ginger, or cloves in place of the vanilla bean. So that concludes our January Seasonal Ingredient Challenge! Any ideas for February? Makes 1 big serving to share. I received Bittman’s book for Christmas, and I’m completely in love with it. The first thing we made out of it (pizza dough, of course) was better than any other recipe I’d used for it before, and the layout is fantastic. And, poached pears sounds like the perfect light dessert to a heavy dinner. Loved reading about the competition!